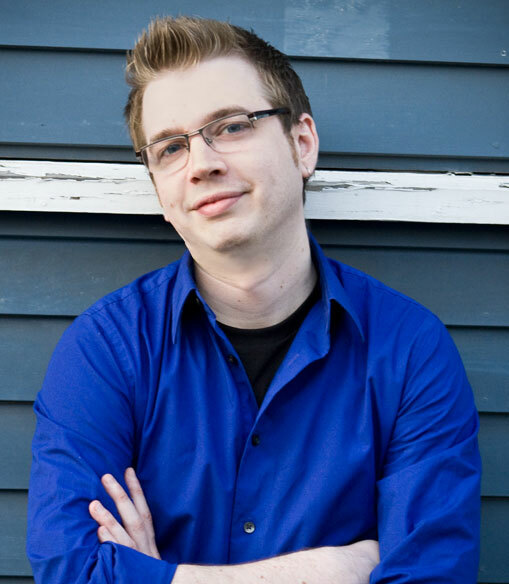 HubSpot’s Dan Zarrella has found that three things must happen to get your content shared. First, people must be exposed to your content (be a fan on Facebook or follow you on Twitter). Second, they must be aware of your content (meaning they actually see it). Finally, they must be motivated by something in your content to share it. Many articles have been written on how to increase your audience size and make people aware of your content, including these by Mari Smith and Denise Wakeman. This article will focus on the motivations for sharing. The New York Times recently partnered with Latitude Research to unpack the psychology of sharing. Based on their study of 2500 participants (and some other recent research), here are 9 reasons why your customers aren’t sharing your content. Stated plainly, people won’t share your content if they don’t find you or your content to be trustworthy. 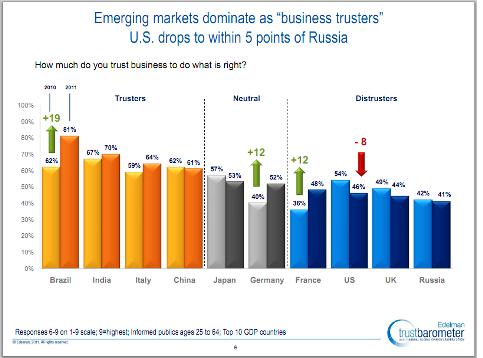 The 2011 Edelman Trust Barometer found that globally only 56% of people trust businesses to do what is right. However, in the US, the UK and Japan, that number fell significantly between 2010 and 2011. Notice the evolution in trust. Key takeaway: To build trust, Guy Kawasaki says the first step is to be trusting. The other recommendation is to lead honest and open public dialogues where you’re not afraid of negative statements. Your customers are looking for valuable information, great deals and a chance to meet other people who share their interests. As soon as you stop offering these things, your fans will go looking elsewhere. They may not feel a commitment to your brand, but you can keep them interested in your content. The next couple of points offer some remedies you can implement immediately. Key takeaway: Determine what your audience values from you and keep giving it to them. In fact, exceed their expectations. “Don’t be boring,” says Grandma Mary, the alter-ego of Social Media Examiner’s Facebook community manager, Andrea Vahl. People are far more likely to share something they find intriguing or funny. Look at the case of Volkswagen’s videos. Their Cannes-winning episode, The Force, a spoof on Star Wars, earned over 40 million views. None of their other videos, more traditional marketing content, came close to 1 million views. Of course, most of us would love a million views. But look at the relative difference in sharing power. Key takeaway: People love to share humor. Get some of your creative staff to find ways to bring humor and fun into some of your posts. See this post by Jason Miller for some ideas. The New York Times found that people are more likely to share about something they are passionate about. Let’s face it. People rarely wake up wondering what they can do for XYZ brand today. But they do dream of ways to help their favorite cause. Whether it’s ending poverty, supporting Greenpeace or advancing a local charity, many people give sacrificially to help things they care about. Notice how CREE has taken a boring subject like lighting and made it a mission and revolution to change lighting in public places across America. While not a cause in the humanitarian sense, this does get people excited about being part of something bigger than your brand or product. Key takeaway: Show your human side. Let fans know what causes excite you and give them a chance to help you spread the word. Research shows that people value relationships with other people, not necessarily with brands. They are definitely looking for community. Your brand might be able to create a platform for that community. 78% of respondents use links to stay connected to people they might not otherwise stay in touch with. 73% of respondents said sharing content helps them find people with common interests. Red Bull does a nice job of sharing content their fans might be willing to share with their friends. 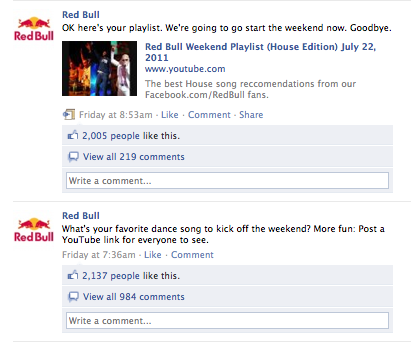 Notice how Red Bull asks a question and then encourage sharing. Key takeaway: Evaluate your posts and ask why someone might share this content with their friends. Some things haven’t changed since junior high. We are all trying to build credibility in the eyes of our friends. We want to be seen as experts in some area(s). The way we do that online is through the content we share. 68% of The New York Times study participants said they share content as an advertisement for themselves. They want to give others a better sense of who they are. Key takeaway: Share highly valuable content and links that will give your fans access to information that will enable them to look good in the eyes of their friends. Ask your fans what they would like to know. You’ve heard it said, “I’m just thinking out loud.” Today many people think out loud through social media. In fact, 73% of the study participants said they process information more deeply, thoroughly and thoughtfully when they share it. Additionally, 85% of respondents said that reading other people’s responses helps them understand and process information and events. 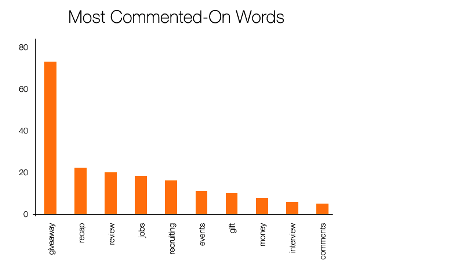 Social media scientist Dan Zarrella found the following words generate the most comments in his research. Notice how popular words like “giveaway” and “jobs” are. Key takeaway: People who share your content may be using it to crystallize their thinking. Make sure to give them some new thought-provoking content and don’t forget to invite their comments. If you’ve been around marketing for very long, you understand the concept of a marketing persona. This idea has been around for at least 20 years and advocates understanding your customer profile by creating detailed pictures of your ideal customer(s). Altruists—Altruists share content out of a desire to be helpful and aspire to be seen as a reliable source of information. Preferred tools: Facebook and email. Careerists—Careerists are well-educated and seek to gain a reputation for bringing value to their networks. They prefer content that is more serious and professional in tone. Preferred tools: LinkedIn and email. Hipsters—Hipsters are younger sharers who have always lived in the “information age.” They use Twitter and Facebook to share cutting-edge and creative content. They share content to build their online identity. Preferred tools: Facebook and Twitter. Boomerangs—Boomerangs seek validation and thrive on the reaction of others to their content, even when it’s negative responses. Preferred tools: Facebook, email, Twitter and blogs, wherever people will engage them. Connectors—Connectors see content sharing as a means of staying connected to others and making plans. They are more relaxed in their sharing patterns. Preferred tools: Facebook and email. Selectives—Selectives are more thoughtful in what they share and with whom they share it. They personalize their sharing and expect responses to their content. Preferred tool: email. Trendsetters—Trendsetters are thought leaders, marketers and business leaders who purposefully seek to stay abreast of breaking news and trends in their industry, sharing it quickly and aggressively. These people are typically seen as experts (or aspire to be seen as such). Preferred tools: Twitter, Facebook and LinkedIn. A couple of observations: 1) notice how many of these personas prefer email; 2) notice that the platform significantly predicts the motivation pattern. Key takeaway: Think through your content-sharing strategy for each platform, knowing whom you are likely to reach. The study authors discovered that people have not abandoned email. In fact, participants share most frequently through email and consider it more private. Therefore they have higher expectations for responses through email. Key takeaway: Don’t forget to integrate your email strategies with social media. Jay Baer will be speaking about this at Facebook Success Summit 2011. He also wrote this article. If you want a deeper understanding of the psychology of sharing, see this article by Dr. Rachna Jain. One of the most overlooked rules in content creation is the rule of simplicity. Shorter posts (80 characters on Facebook) get shared 27% more frequently. Keep your writing style at a fifth grade or lower level of understanding. Create a sense of urgency in your writing. Give people a reason to respond now. If they don’t act immediately, they probably never will. Finally, remember that getting your content shared is just the first step. See this as part of longer-term strategy of building a loyal following. What are your thoughts? I’d love to hear your comments on how you get your audience to share your content. If you have any stories, please leave them in the comments box below.